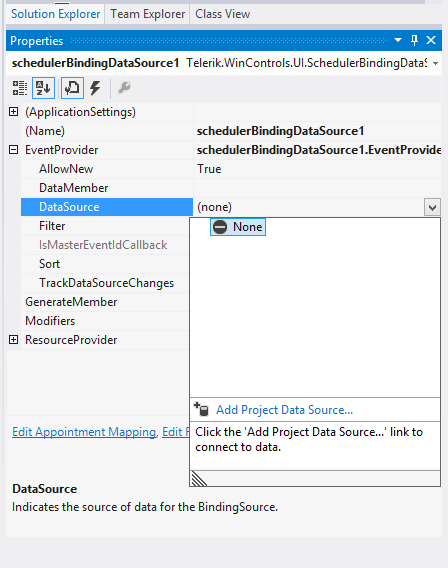 This tutorial will show you how to bind RadScheduler from the Visual Studio design time surface, by only using the RadScheduler design-time support, and without writing any code. The tutorial uses the data base which comes with the installation of Telerik UI for WinForms. 1. Open Visual Studio and start a new Windows Forms project. Open the form, created by the project. 2. Drag a RadScheduler from the toolbox to your form. 3. Drag a SchedulerBindingDataSource from the toolbox to your form. 6. Set the Appointments and the Resources data sources. To do that, in the Properties window, open the EventProvider property. Drop down the DataSource sub-property list and select Add Project DataSource... This step will display the Data Source Configuration Wizard dialog. 7. 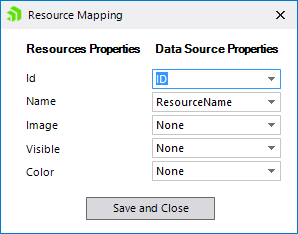 In the "Choose a Data Source Type" page of the wizard, select the Database type and click the Next button to continue. 8. 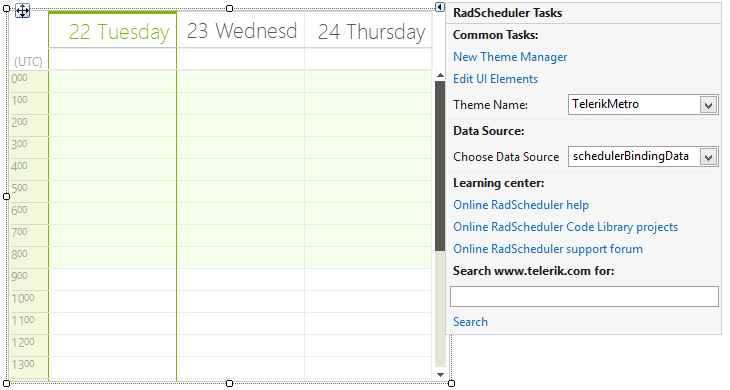 In the "Choose a Data Connection" page of the wizard, add a connection to the SchedulerData.mdf file supplied with Telerik UI for WinForms distribution. Click the New Connection... button to display the Add Connection dialog. Click the Change button and select the Access Database File option. 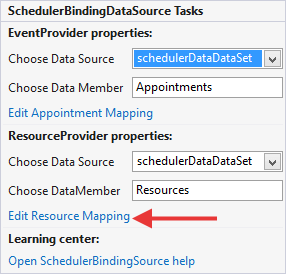 Set the Database File Name to the Schedulerdata.mdb file located in the Telerik UI for WinForms installation directory under \Examples\DataSources. Click OK to close the Add Connection dialog. 9. Back in the "Choose a Data Connection" page of the wizard, click the Next button to continue. 10. A dialog will pop-up to ask where the file should be located. Choose No to leave the file located in the \Examples\DataSources directory. 11. In the "Save the Connection String in the Application Configuration File" click the Next button to continue. 12. 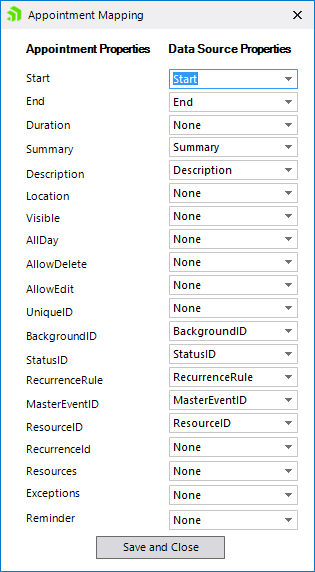 In the "Choose Your Database Objects" page of the wizard, select the "Tables" checkbox to automatically select the Appointments, Resources and AppointmentsResources tables. 13. Click Finish to complete the wizard and close the dialog. This step will create a DataSet component and add it to the component tray below the form designer. 14. Then you need to edit the mappings between the objects used in RadScheduler and your data source objects. 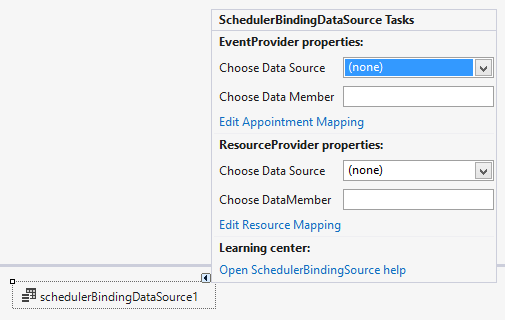 Open the SchedulerBindingDataSource ActionList and specify the DataSource for both the EventProvider and ResourceProvider to the binding source. 15. 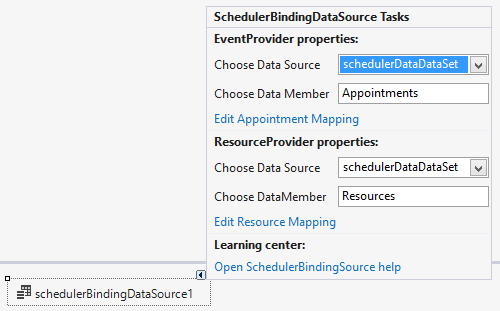 While still in the SchedulerBindingDataSource ActionList, set the DataMember properties for both the EventProvider and ResourceProvider to the respective tables. 16. 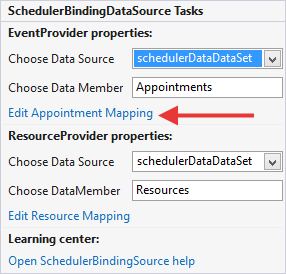 While still in the SchedulerBindingDataSource ActionList, click on the Edit Appointment Mapping link. Exceptions is a self-relation in the dataset, in this case AppointmentsAppointments.